How many co-branding partners can I have? There is no limit to the number of co-branding partners that can be created. How do I create a new co-branding partner? Click on a tapper's name, then click the toggle marked "Co-branding partner". Fill out the key information about your co-branding partner, upload headshot and logo images, and you're good to go. Don't forget to click the "Update" button to save your changes. How do I (the app owner) share a co-branded version of my app? There are two ways to share a co-branded version of the app. The first is from Tapptracker. Look for the "Co-branded with" drop-down selector on your main share page. The second way is from your member dashboard. Click "Send app", which is the large blue button at the top left of your screen. Look for the same drop-down selector at the bottom of the pop-up window. How does a co-branding partner share the co-branded version of the app once I've set them up? Once a Tapper has been elevated to co-branding partner, the version of the app that they have on their phone will automatically switch to show the co-branded version. Subsequently, every new share that is sent by the co-branding partner will show the co-branded experience. Can I switch existing Tappers so that they see a co-branded version of my app? Yes! Simply click into the Tapper detail record, then use the drop-down labeled "Co-branded with" to select which version of the app you want the Tapper should see. By default, the drop-down is set to "None", which means the Tapper is seeing the default version of your app without co-branding. Can I remove a co-branding partner from my app? Yes. There are two ways to accomplish this: a reversible way, and a permanent way. Reversible: In the Tapper list on the member dashboard, click on the name a Tapper who is associated to the co-branding partner you want to remove. In the Tapper detail record, change the drop-down value labeled "Co-branded with" to "None". Repeat this for every Tapper (including the co-branding partner themselves) who is currently set to the co-branded version of the app that you want to remove. Permanent: In the Tapper list on the member dashboard, click on the name of the co-branding partner you want to remove. Near the bottom of the screen you'll see a toggle switch labeled "Co-branding partner". Click it, and the toggle will turn grey (off). Next, click the "Update" button to save your changes. You'll see a pop-up warning letting you know that this action is irreversible. Click OK and all your Tappers who previously saw the co-branded version of your app will be reverted to your default (non-co-branded) app. Are there any best practices about how to configure my app for successful co-branding? Yes! The most important thing to remember is that you are co-mingling information about two different people into the same app, which has the potential to confuse users. As a result, we recommend that you label every button in such a way that it is obvious who is associated with that button. The most important step in doing this is to remove all references to "me" and "us", since the app users will not know whom you're referring to. For example , consider that the App owner is named Josalyn and the referral partner is named John. In this case, re-label the App owner's contact buttons as "Call Josalyn's Cell", "Text Josalyn", and "Email Josalyn". In addition, change the "About me" button label to "About Josalyn". Finally, label the cobranding partner's property search web link as "John's Property Search". How much does co-branding cost? 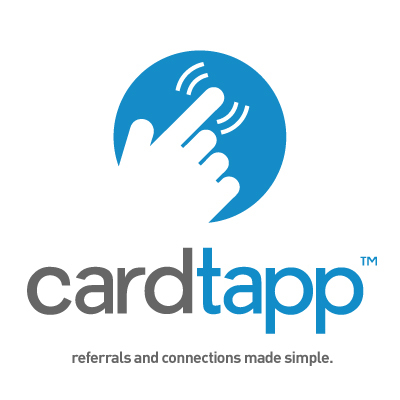 Co-branding is part of the Cardtapp "Accelerator" package. See our pricing page, or for monthly pricing give your sales representative a call at (855) 883-5127. Ready to set up co-branding on your app? Watch the video below for a quick and easy tutorial on how to set it up.